Get ready for another return to glory. Valiant Entertainment sent out a teaser today that has got the comic world talking. 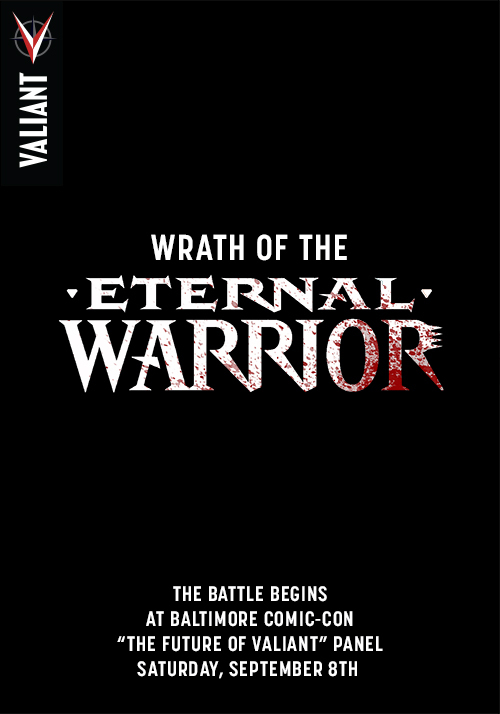 It looks like one of the surprises to be announced at the Baltimore Comic-Con will be Wrath of the Eternal Warrior. Eternal Warrior is a past Valiant title that ran for 50 issues, and follows the story of one of the world’s last natural immortals. In the old books, he was the brother to Armstrong, who is celebrating much success with the relaunched Archer & Armstrong, but it remains to be seen how the relaunch will play out. So if you are hitting the Baltimore Comic-Con this weekend, make sure to go to the Valiant Panel!